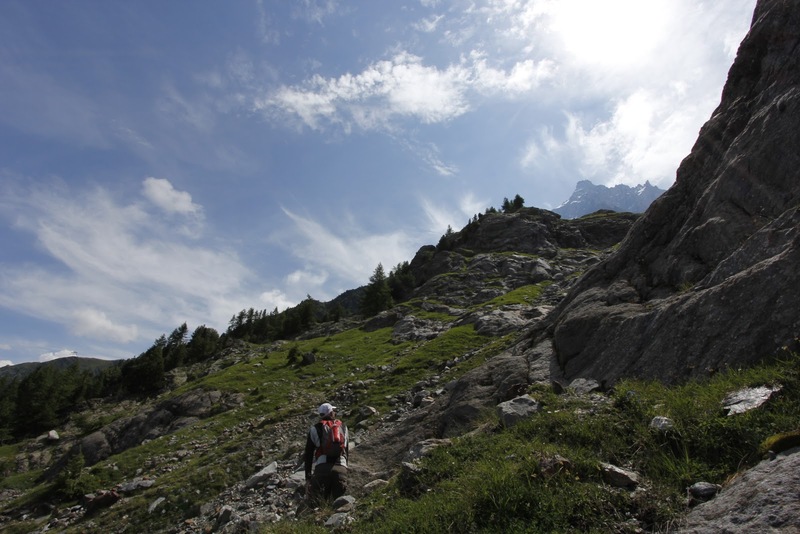 For our last day in Chamonix we had a grand plan to hike to Chalet Les Glaciers at 2440m via Chalet La Para. We started our hike a little later this morning, so the cafes were open and I could start the day properly caffeinated. 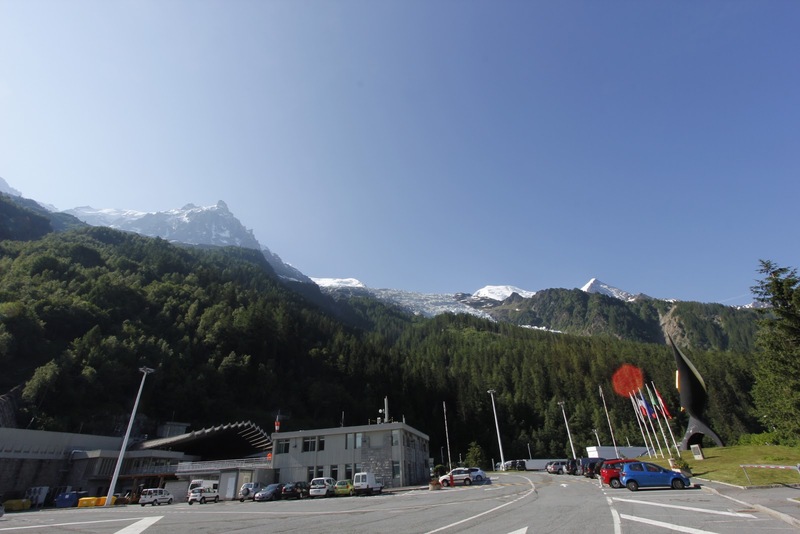 The map showed the path up the mountain crosses near the entry to the Mont Blanc Tunnel which goes through from France to Italy. Following the trail signage out of Chamonix we quickly popped up in a car park just next to the entry into the tunnel. Not sure which way to go I asked a policemen standing near and he pointed across the road and said yes… yes that way, across the path of truck and car traffic. Are you sure? Bien sur…. that way. I found it hard to believe that a walking trail would cross the main road route between France and Italy. Luckily traffic was slowing as it approached the tunnel and with hearts thumping we made it across. We eventually found the trail markers but they were all leading to Chalet du Cerro and Plateau de Pyramids on the Glacier du Bossons. 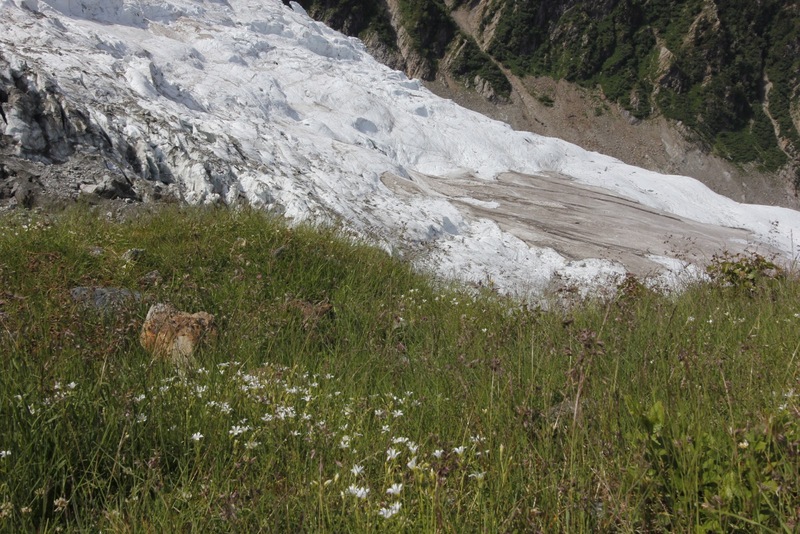 Since we made it this far we settled for walking to the Glacier Des Bossons. It was only on our return that we saw where we went wrong. 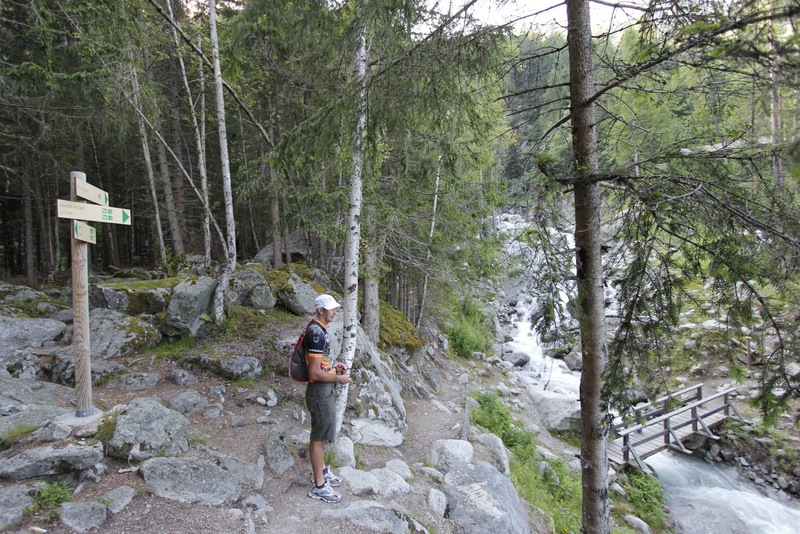 The trail goes under the road to the tunnel – clearly signposted we just did not see it. My bad, but we survived the road crossing. 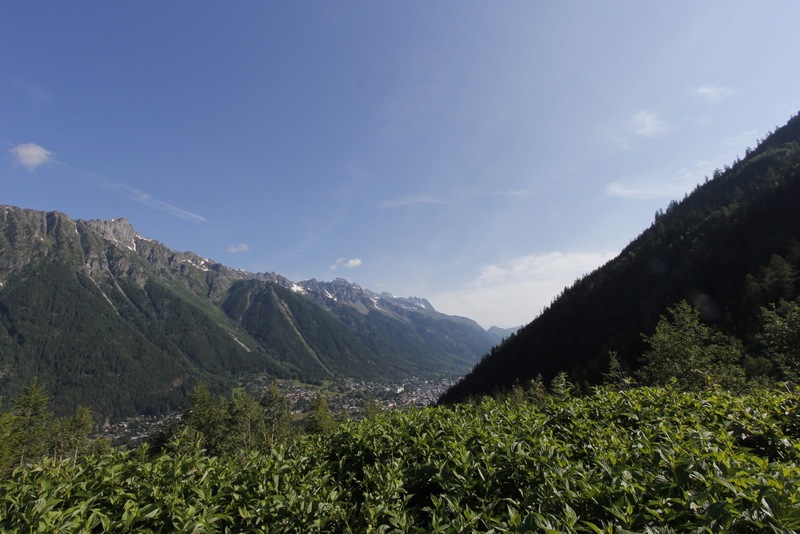 As we continued to climb, the south side of the valley came into view with Chamonix down below. We could see the trail we walked yesterday as it zig-zaged its way up the side. 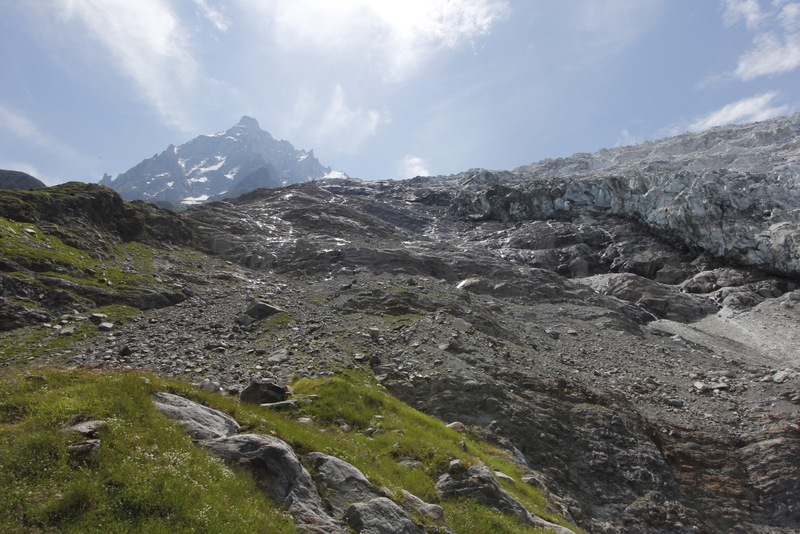 The next challenge was for me to overcome my fear of heights as we ascended towards the side of the glacier and the path became a steep rocky scramble through an old glacial valley. Hammer had no problems and left me behind to slowly make my way up, trying not think about how I will get back down. We made it as far as safely possible at around 1,900m elevation. The view of the glacier from this vantage point is truly humbling. Earlier on the walk up we went past a lookout to the toe of the glacier at around 1,350m elevation and a French lady told us she remembers bringing her baby son, now in his 40’s to this spot and you could walk out onto the glacier. It is sad to see how far it has receded and still continues to do so. 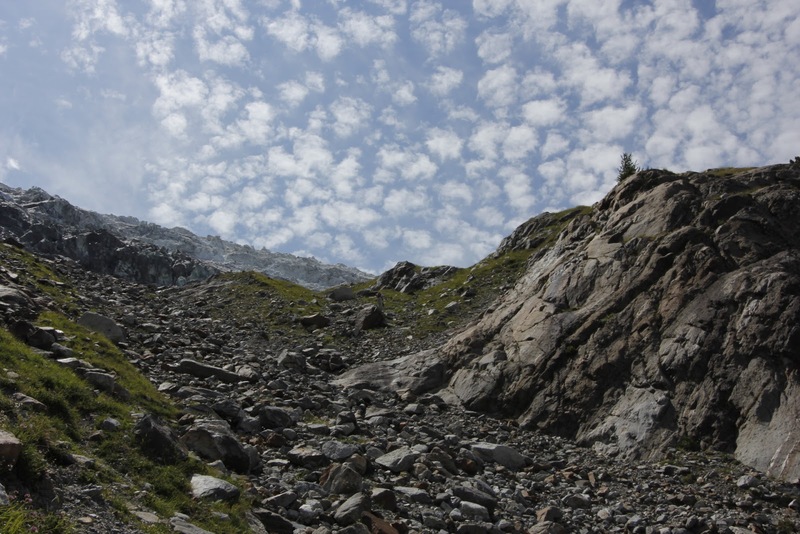 While we were part way up the glacier a section came off sending rocks tumbling down. Some way away from where we were but still a reminder of an active process that is irreversible. 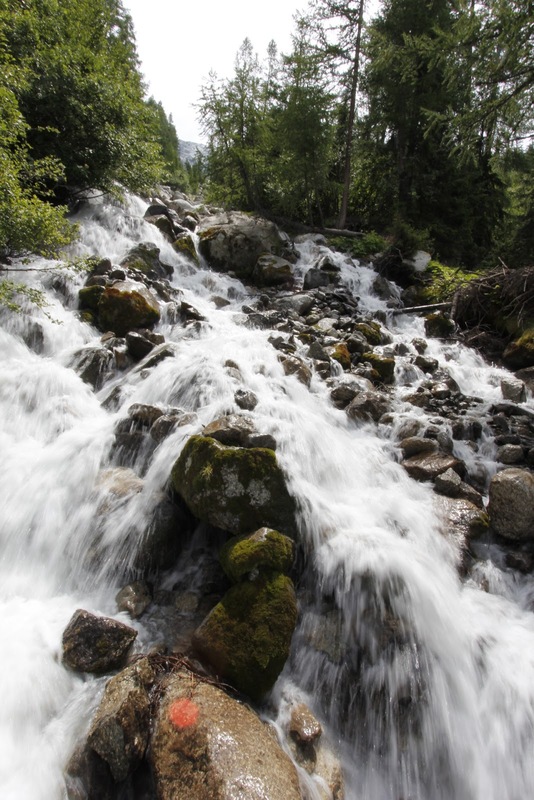 The melting ice creates gushing torrents of water down through the valley. As I write this, it is late afternoon and it is starting to thunder and rain outside. 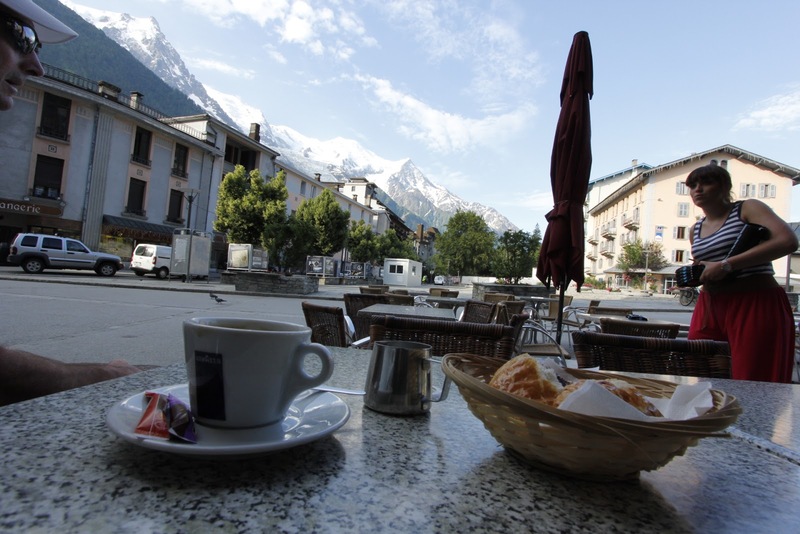 Nothing like receding sunshine to clear the busy streets and outdoor cafes of Chamonix. After 3 days of hiking some of the trails around Chamonix I have a whole new respect for anyone who completes the Utra Trail Du Mont Blanc. The UTMB is a 160km trail running race that passes through France, Italy and while Switzerland circum-navigating Mont Blanc. The race is on the 30 August and there are signs of race preparation around town already. Hats off to anyone who completes it.